The Oakland Fire Department, Emergency Management Services Division is dedicated to planning for emergencies in order to preserve the well-being of our entire community. Explore the links and sections below for information about how we are working with various members of our community to be prepared for disasters. For individual/family preparedness and pet preparedness please visit the CORE section of this website. Subscribe today to Oakland's Emergency Notification System; opt in now at: www.acalert.org to receive phone, text, e-mail or TTY Alerts. Be informed - Listen for official information and follow the instructions provided by emergency response personnel. See information below about Oakland's Emergency Siren Alerting and Warning System. Plan Ahead - Make a plan today. Know how you’ll contact one another and reconnect if separated. Establish a family meeting place that’s familiar and easy to find. During periods of heightened threat increase your disaster supplies to be adequate for up to two weeks. Take Action - Get Involved! Community leaders agree the formula for ensuring a safer community consists of trained volunteers and informed individuals taking action to increase the support of emergency response agencies during disasters. There are many things you can and should do to protect yourself and others from heat related emergencies. NEVER leave infants, children, the frail elderly or pets unattended in a parked car. STAY hydrated drink plenty of water. Don’t wait until you’re thirsty. clothing. Use a hat and sunscreen as needed. DO outdoor work or exercise activities in the morning when it’s cooler. Remember to be FIREWISE on Extreme Heat and Red Flag Warning days! Give your household the best chance of surviving a wildfire by being ready to go and evacuating early. Have an Evacuation Plan; know what to take and where to go if a wildfire strikes. 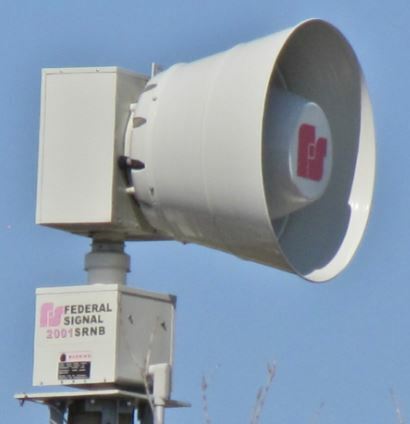 Emergency sirens are an important part of the City of Oakland’s public safety infrastructure. The siren system has been upgraded as is “live” as of April 2017. A siren sound alert outside of the monthly testing means that there is an emergency in your area, a potentially dangerous condition or an impending threat. You should turn your radio to one of the following local emergency broadcast news stations: KCBS (740 AM), KGO (810 AM) or KNBR (680 AM) and consult other media sources to confirm event details. · Sirens will sound in the event of dangers resulting from earthquakes, chemical spills, large fires, terrorist acts or other public safety incidents. · Monthly testing: A 90-second slow wail tone will occur the first Wednesday of each month at noon to test both system readiness and enhance public awareness of the system. Shelter in Place: Three-minute steady tone to alert the public to take shelter. Consult media sources to confirm event details. Tsunami Alert: Three-minute slow wail tone to alert the public that a Tsunami is possible or eminent. Consult media sources to confirm event details. Fire Alert: Three-minute fast wail tone to alert the public that there is a fire. Consult media sources to confirm event details. Oakland has a new Emergency Notification System; opt in today at: www.acalert.org to receive phone, text, e-mail or TTY Alerts. The business community can play an important role in disaster response and recovery - but only if your company survives a major emergency and can organize its efforts in advance. The Oakland Fire Department, Emergency Management Services Division is reaching out to local merchants to encourage and assist with business preparedness. We are working through a number of business groups and organizations including the Oakland Chamber of Commerce and the Oakland Merchant Leadership Forum. We can provide your business with guidance on continuity planning, testing your company's emergency response plans and identifying gaps, and providing your employees - your business' most valuable assets - with a sense of security and comfort through emergency planning. Help develop a strategy to minimize damage and lost time following a disaster. Help prioritize critical business functions and determine how quickly they must be recovered. Determine alternative operational locations if their primary location is not available. Let us help you plan today so your business will survive tomorrow. If you are interested in receiving training to equip your company and your employees to successfully and efficiently recover from a disaster, please contact our office at (510) 238-3938. Community-Based Organizations (CBOs) play an enormously important role in a community before, during and after an incident. CBOs provide vital support services to support preparedness, response and recovery efforts through sheltering, emergency food supply, counseling and other services. It is critical for CBOs to have relationships with emergency services to collaborate with responders, local government and other agencies and organizations. How can CBOs be better prepared for an emergency? As a community-based organization, you play a very important role in the communities that you serve. Emergency Plan. In the event of an emergency, it is important for you to have an emergency plan in place, that will help you stay open and continue to provide service to your customers or clients. Customers’ needs may be more critical during an emergency. Network. By networking with other CBOs within the City of Oakland before and after disaster, you are in a position to connect with similar agencies for support. How can CBOs promote preparedness among its customers and clients? Promote personal and household preparedness. Understand the importance of preparedness and distribute material to customers and clients. Participate with the Oakland CORE program and assign a key staff person to have the responsibility for linking customers and clients to this or similar programs. It takes everyone working together to make our communities safer and more disaster resilient. The following information is provided to assist community members with preparing for various types of emergencies. Click on the links below for hazard-specific emergency preparedness tips from www.ready.gov.